SHOP TOUR SHOP TOUR SHOP TOUR 8 0 P R I N T W E A R J A N U A R Y 2 0 1 9 Printwear Shop Snapshot : Topshelf Printers G rowth is something most decorators look forward to, whether that's adding new employees, growing the client list, or expanding their production area. For Colo- rado-based Topshelf Printers, the last few years have been a powerful combination of all these elements. Originally founded in Fort Collins in 2010, the business began with approximately 14 employees in a 5,000 square-foot space. Within the first few years, Topshelf 's initial production facility jumped to 10,000 square feet. In 2014, opportunity struck, and the company found a new space just down the high- way in the city of Greeley, Colorado. Since then, the shop's workforce has grown to 85 employees and a constantly evolving production area. "Over the last year we've added a 27,000 square-foot expansion onto our existing building, putting us at roughly 53,000 square feet," explains co-owner Blake Burroughs. "Our shop has grown about four times as far as capacity goes." That expansion traces back to a number of major advancements in the shop, including an early 2016 contract to print Super Bowl T-shirts. Topshelf had a preexisting deal with Nike to screen print the official Super Bowl 50 Championship T-shirts if the Broncos won. Thankfully the numbers were on their side, and with a 24-10 win by the Colorado team the shop had a massive job on their hands that helped bolster their already bustling business. Despite that bright spot, Dan Freismuth, Topshelf 's second co-owner, notes that recent years haven't been without challenges. The sports market has been a revenue generator for the shop like most decorators, but it's not the only place they focus their efforts. "Things got very difficult a couple of years ago," Freismuth stresses. "We decided to ex- pand our capacities and our capabilities." That included improving the shop's approach to different decoration techniques, as well as adding machinery and ensuring operators all knew how to run that equipment properly. Since 2016, Freismuth says he's seen the shop grow year-over-year in the 25–30 percent range. More recently, both Burroughs and Freismuth point to a partnership with Stahls' as a leg up in the business' growth. Topshelf joined the company's Decorator Network, which provides them with broader access to the company's technology and supplies. "[Stahls'] came out and saw our facility, our rapid growth, and how we manage our customers and decided we were a good partner for [the network]," explains Freismuth. 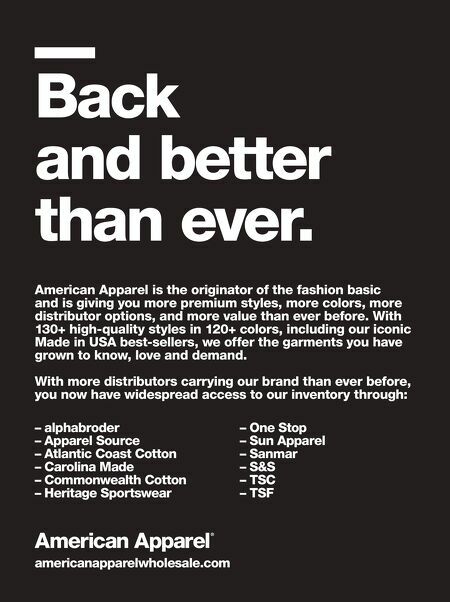 That access has helped the shop expand its client base and product offering as they con- tinue to forge ahead. Along with keen attention to customer needs and fast turnaround times, Burroughs credits Topshelf 's ability to scale and learn from challenges its strengths in constant growth. "Even with some of the failures we've dealt with, we still con- sider our customers as partners, so we're not scared to jump in the ring and go to bat for them," Burroughs stresses. Freismuth echoes this sentiment when asked about why he likes being involved in the industry and why the duo is excited for the coming years at Topshelf. "I never know what I'm going to walk into with a new job and overcoming chal- lenges that are met with a sense of grati- tude when you exceed a customer's expec- tations…it's really what keeps me going. It's certainly not a boring job; there's al- ways something to troubleshoot or make better," Freismuth states. For more information, visit http://www. topshelfprinters.com. PW AT A GLANCE LOCATION: Greeley, Colorado OWNERS: Blake Burroughs and Dan Freismuth SQUARE FOOTAGE: 53,000 sq. ft. PRODUCTION EQUIPMENT: • Seven M&R Sportsman automatic screen-printing presses • 55 Tajima embroidery heads • Multiple Hotronix machines with flat and hat platens • Kitting department: Re-label, bag, tag, size sticker, and drop- ship capabilities Like many apparel decorators, sports events add to Topshelf's busy production schedule. The com- pany has a bustling embroidery depart- ment at its Colorado headquar- ters. 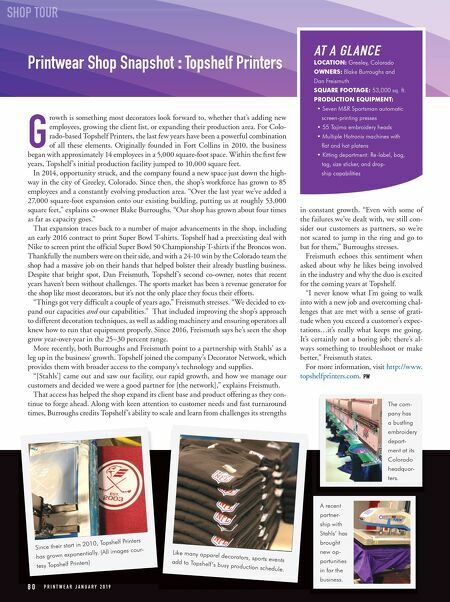 8 0 Since their start in 2010, Topshelf Printers has grown exponentially. (All images cour- tesy Topshelf Printers) A recent partner- ship with Stahls' has brought new op- portunities in for the business.